She likes to stay in beautiful hotels. He likes them too…but not necessarily the price tag that comes with them. They spent their honeymoon in Bora Bora. She loved it. He, not so much. And so their marriage began. 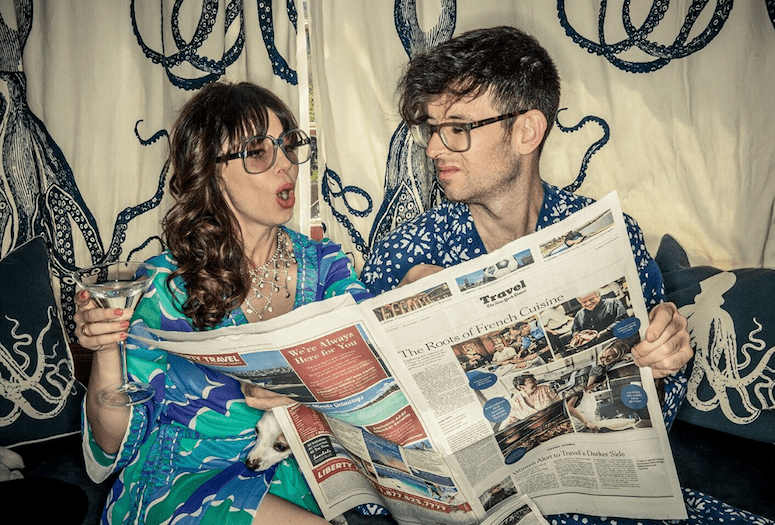 Newlyweds Moshe Kasher and Natasha Leggero, both, accomplished actors, writers, and comedians are now navigating life as a married couple. •	She currently stars in the Comedy Central series Another Period, which she also co-created, wrote, and produced. Moshe Kasher and Natasha Leggero bring “The Honeymoon Tour” to the Ace Hotel & Swim Club in Palm Springs. Traveling “honeymoon style” in a Scamp Trailer, Kasher and Leggero will stop by to perform June 9 at the Ace Hotel & Swim Club in Palm Springs. Leggero says, “Each show on the tour has been its own unique special party.” They’ve had fun with surprise guests (Amy Schumer came up on stage in Hawaii), friends joining them on the road and different comics have opened up for them.